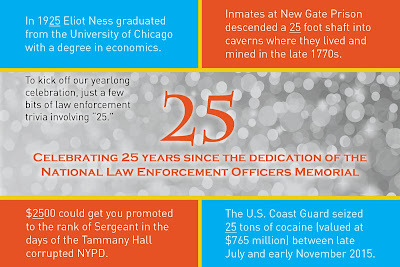 In honor of the 25th anniversary of the National Law Enforcement Officers Memorial, dedicated on October 15, 1991, the Museum Insider will showcase the number 25 in a new feature each month throughout 2016. So stay tuned! To kick things off, enjoy a few bits of law enforcement trivia.